How do museums function with public and employee space? 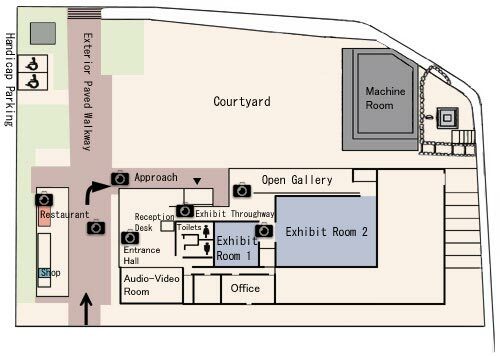 Most museums try to keep all the employee areas like break rooms and offices away and hidden from the rest of the museum. Nobody touring wants to be walking around and find a room that has nothing important in it. The employee rooms are normally accessible by only a few ways to keep people from wandering in there. What are the major issues with museums today? The main problem with museum is trying to bring in people from all audiences. Of course younger people probably won't want to visit a museum, but if the museum has a fun atmosphere, people from any age will enjoy going. Now the problem in that is more of a design issue. It's hard to design something everyone will enjoy. How does one address those issues? If a museum that can actually adapt to its own issues could be made life would be a lot easier.Museums have to accept its own issues in order to solve them. Every museum has to go through the design and building state and its issues will come up during that time period.Museums need a whole lot of space, and they have realized that and fixed it by expanding space. How does one layout everything with each other (exhibits, entrance/exit, restrooms, ect.)? The trend for museum layouts is to keep all the museum-y stuff together, and all the other areas separated. Things like stairs and restrooms should be around the same area, and things like entrances and exits should be paired with ticket areas and reception desks. Most museum categorize the exhibits by what they show, but keep them flowing together. The Perot Museum in Dallas is a great museum layout to keep everything flowing nicely. Its laid out by floor, but has the exhibits flowed together. Can museums be made vertically? Can storage be adapted vertically? How can museums relate with their surrounding area? The museums have to blend in/ adapt with their surrounding area. A museum that does not in any way blend in or at least is modern will be out of place. The exterior is extremely important in that its what everyone sees first. Imagine a skyscraper in the middle of Kansas. Doesn't really fit, does it? Museums need to match their surrounding areas and the culture to fully fit in and become something great.